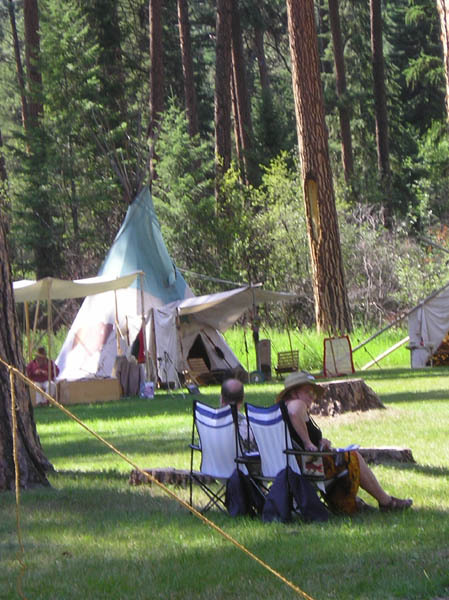 The 2018 dates for the Two Rivers Rendezvous will be July 13th, 14th and 15th. Due to the high fire danger the past two years we moved the date up a week. Also we will be having a spring rendezvous at Fawn Creek on April 13th, 14th and 15th, 2018. 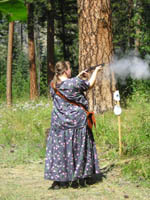 This event is an annual gathering of modern day mountain men in the beautiful remote mountains of northwest Montana, east of Libby. 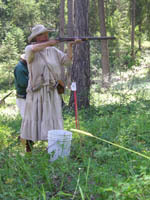 Time-period authentic clothing and equipment required for participants. 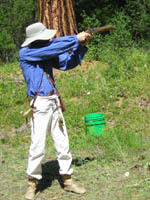 Events include rifle & pistol trails, hawk/knife trails, fun shoots, mountain man run, peewee & junior activities, more. Camping available. Modern day visitors are welcome. Matt Denison from Superior. Photo by Maggie Craig, LibbyMT.com. 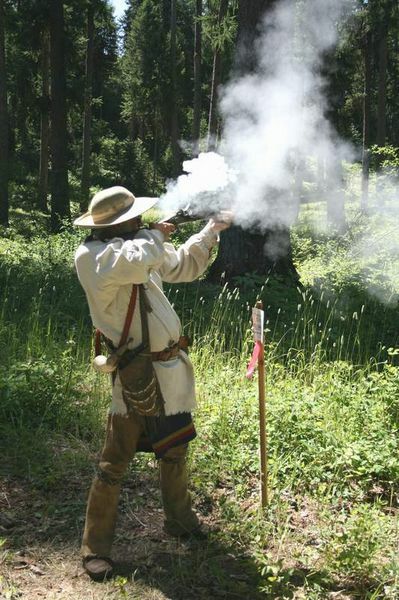 Note, some black powder events may be rescheduled if fire danger becomes high and prohibits them. 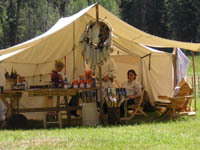 The Two Rivers Rendezvous is held each July at the Fawn Creek Campground near the Fisher River east of Libby. 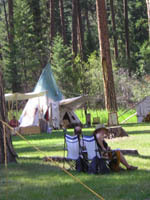 Camping available in primitive, modern tent and "tin teepee" areas. Visitors and spectators welcome, need not dress in period clothing. This is a family event. Children welcome. There will be youth events and prizes awarded. What is a Rendezvous? 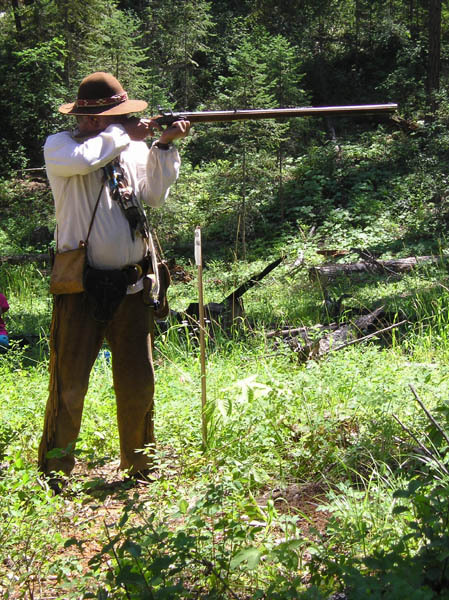 During the fur trade era of the early 1800s in the Rocky Mountain west, this was an annual gathering during the summer when the working fur trappers gathered to trade in the pelts they had trapped in exchange for supplies and monetary payment. This was a huge industry in the early 1800s, all focused on trapping beaver to supply beaver felt to make fashionable beaver tophats for people in the east and Europe. 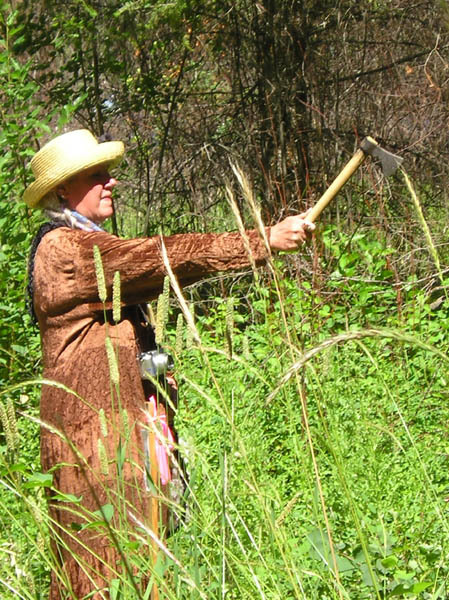 The fur trappers of the early west explored the west and helped locate and open the critical routes and passes that were later used by Oregon Trail emigrants to travel from the east to settle in California, Oregon and Washington. 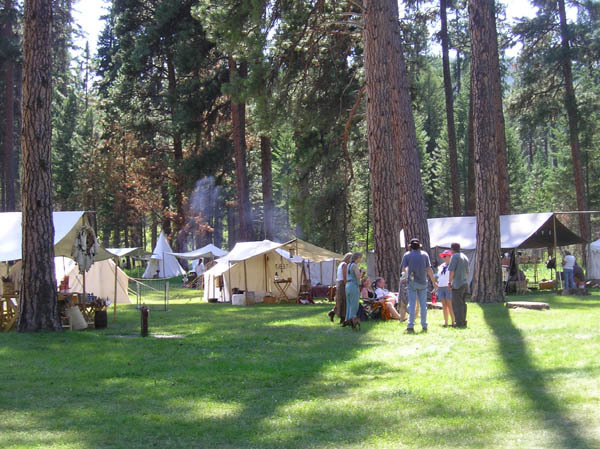 The location for the original annual rendezvous gatherings varied from year to year, with the location for the next year's rendezvous set and announced at the previous one. Fur trappers and Native American Indians from various tribes traveled from all over to meet the supply trains and trade for goods. 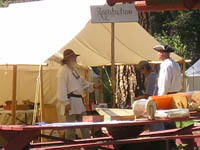 Rendezvous was held during the summer, the "off-season" for fur trapping, and typically lasted several weeks. The days were filled with socialization, trading, making new business deals, games, races, gambling, drinking and much more. 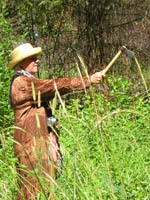 Today, many people still enjoy reliving the lifestyle of the mountain man. 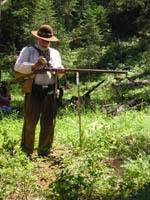 Modern buckskinners, or mountain men, sometimes spend lifetimes learning about how the rugged mountain men of the 1800s. These rugged individuals lived and travelled extensively through what is Montana, Wyoming, Idaho, Utah and Colorado. These men lived in extremely primitive conditions in a wild and unsettled land. They faced danger on a daily basis from the elements, horse and gun accidents, wild animal attacks, injuries, attacks by hostile indian groups and rival trappers competing for furs. Their main work was done in the dead of winter when the animal's pelts were the thickest and worth the most money. It was an extremely hard life that tested men's physical strength and courage constantly. According to the organizers of the Two Rivers Rendezvous, "Modern day rendezvous are as varied as the folks who put them on. 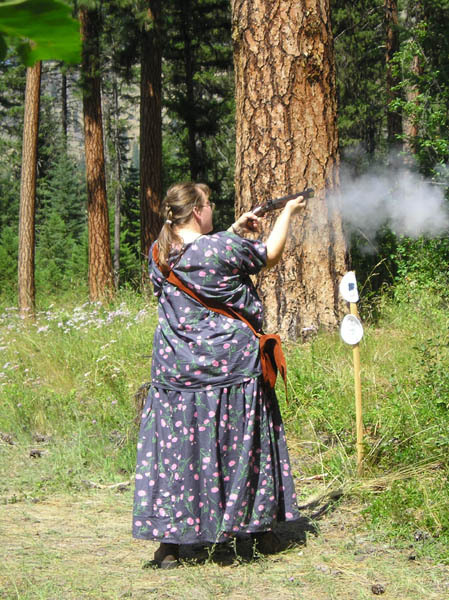 Some are shooting matches in traditional garb. 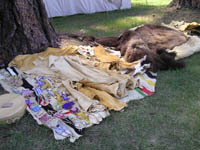 Others go much further with activities for the whole family, games, trade shows, contests of skill and luck with camping and dress of the period from 1800 to 1840. 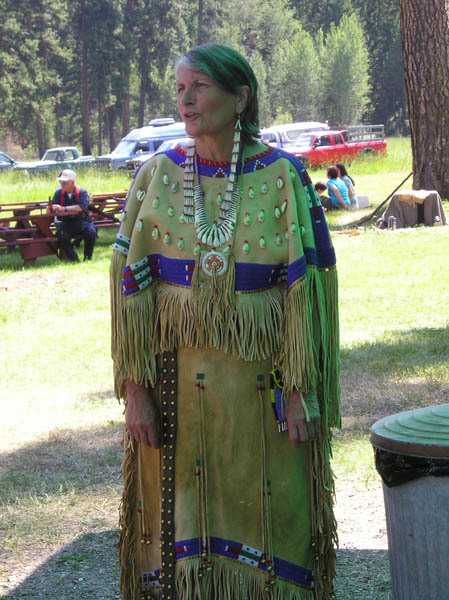 You don't need a full set of buckskins to fit in, a calico shirt and canvas pants work just fine for the men with traditional prairie dresses for the women." 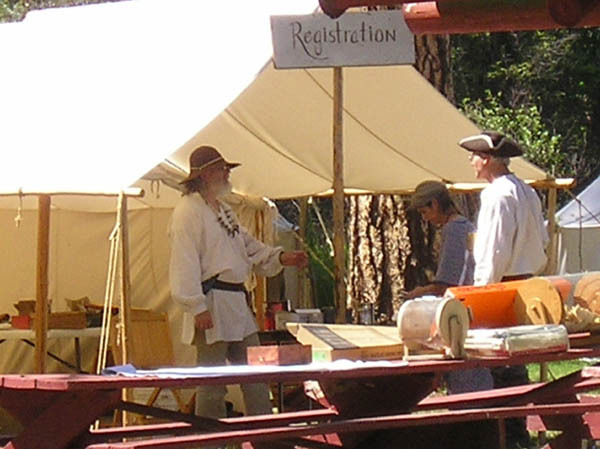 Participants in the primitive camping area are expected to dress in period clothes with era-authentic equipment and style. ALL CAMPS will pay a $_____ fee. $_____ per shooter plus blanket prize for each shooter. Traders - voluntary donations accepted. Dry Camp - Bring your own drinking water! 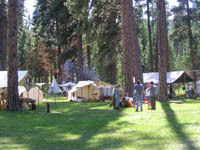 Separate Primitive and Modern Camping areas. Fire bucket & shovel required. Open fires will be restricted. Be prepared to shoot early in the day due to fire restrictions. Directions: From Libby, go north on Highway 37 for 14 miles. Just after crossing the Fisher/Kootenai River bridge, take a right and continue for another 8 miles. Watch for the Fawn Creek Campground sign on your right. Enter the gate and follow your nose! Separate Primitive and Modern Camps. See above for restrictions! 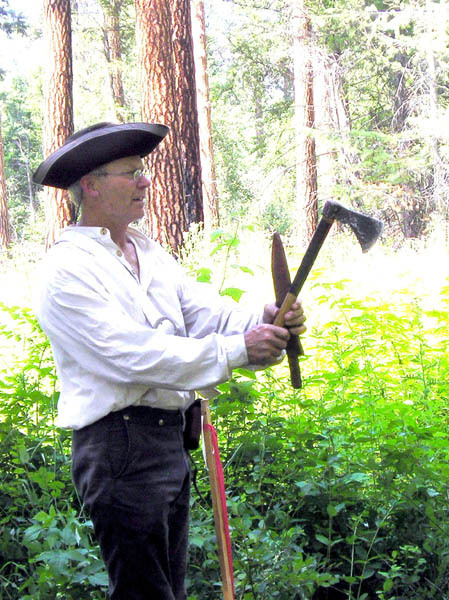 Editor's Note - See our sister sites related to the Rocky Mountain Fur Trade Did you know that mountain men David Thompson, Jedediah Smith and David Jackson (to name a few) camped and traveled in the northwest Montana area in the early 1800s? 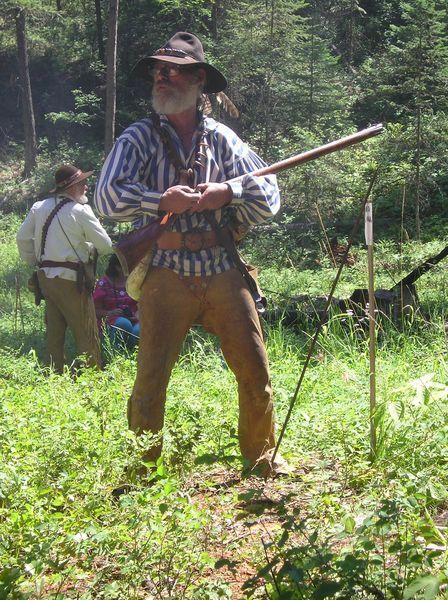 Are you interested in learning more about mountain men and the fur trade era? 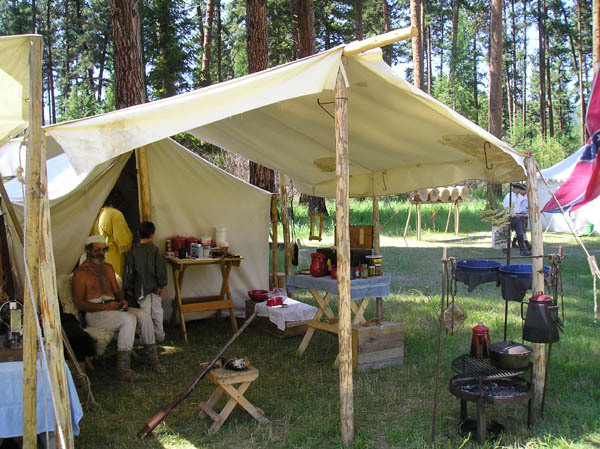 See our sister website, Pinedale Online, in Pinedale, Wyoming, for more about the Rocky Mountain Fur Trade era and mountain man rendezvous. 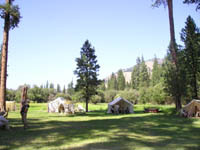 Six of the 16 rendezvous of the 1800s were held at the confluence of the Green River and Horse Creek near present day Pinedale, Wyoming. Pinedale is also the home of the Museum of the Mountain Man, dedicated to the history of the mountain man and Plains Indian culture of the fur trade era. 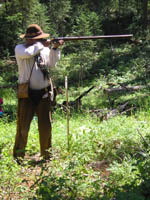 Pinedale Online helps to sponsor this LibbyMT.com website and supports the efforts of education about the fur trade era and the American Mountain Men and similiar Muzzleloader and Buckskinner groups. 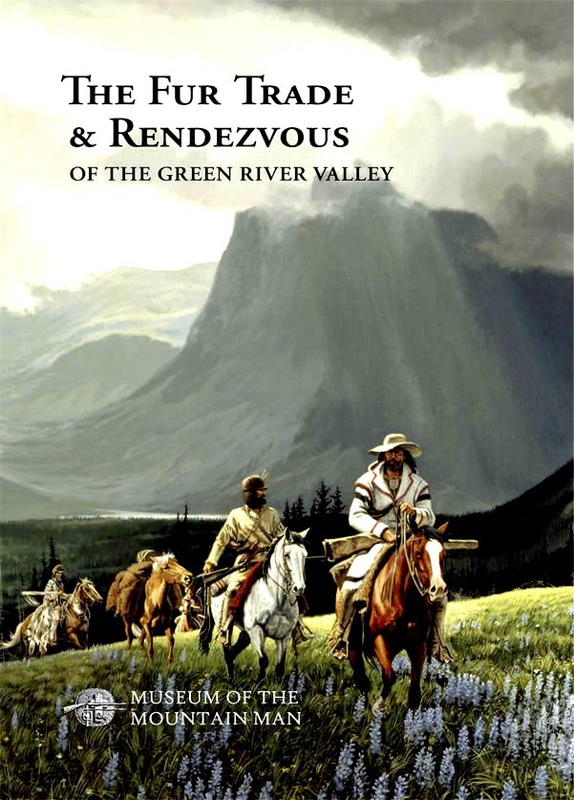 We helped with the design and layout of "The Fur Trade & Rendezvous of the Green River Valley", produduced by the Museum of the Mountain Man, edited by Dr. Fred Gowans and Brenda D. Francis, and available online at the Museum website trading post.We helped with the Museum's new Rocky Mountain Fur Trade Journal and forum, which debuted July, 2007, at the Green River Rendezvous in Pinedale, Wyoming. The Journal is an annual, peer-reviewed academic journal on topics related to the Rocky Mountain fur trade of the early 1800s. 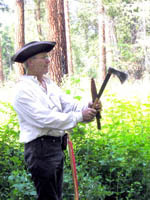 The Rocky Mountain fur trade also intertwined with the fur traders and trappers of Libby's Kootenai Valley, David Thompson, and the lives of the Flathead and Kootenai Indians in the northwest Montana area. We support the Two Rivers Rendezvous and those who enjoy learning more about the Rocky Mountain fur trade in the western United States. We encourage any buckskinners, mountain men, black powder enthusiast, amateur historians and anyone interested in the Rocky Mountain fur trade era, and willing to write a research paper on any related topic, to check out this journal. Up to 10 articles are chosen each year for publication.